Datasets – Datasets are just values of the datapoints over time. You cannot just get all data from a datastream. You have to query for a specific time range. Google expects you to provide start and end date as 64 bit integers with nanoseconds from epoch. This requires some calculations but makes the service future proof. So far I found nothing with such a precision in my data. Having read the documentation I started playing, to figure out what Google knows about my living and training habits. The first natural choice to see `what’s in the data` was Google APIs Explorer. Just a few minutes of work with the tool proved the old saying about data analysis to be still true – 80% of time is spent on data preparation. Google’s tool wasn’t too friendly with input parameters and would kill the browser whenever the output file was larger than few hundred kilobytes. Certainly I needed another solution. So here comes the app. The UI is based on the most common stack of open source components like Bootstrap, SSAS, etc. Authentication is via Google Account only. Default view for the user is the list of his datastreams (datasources). After logging in, the user must refresh the list manually. As the picture shows, I already have 27 streams in Google Fit, most of them coming from com.google.android.gms which is Google Play service running in the background on phone. The list lets you either to get JSON specification of the datastream or dig in deeper to the datastream extraction form. Submitting the form gives you a nice formatted JSON file with your datapoints. Now that I had the data and an easy way to get it out, it was time dig into it. 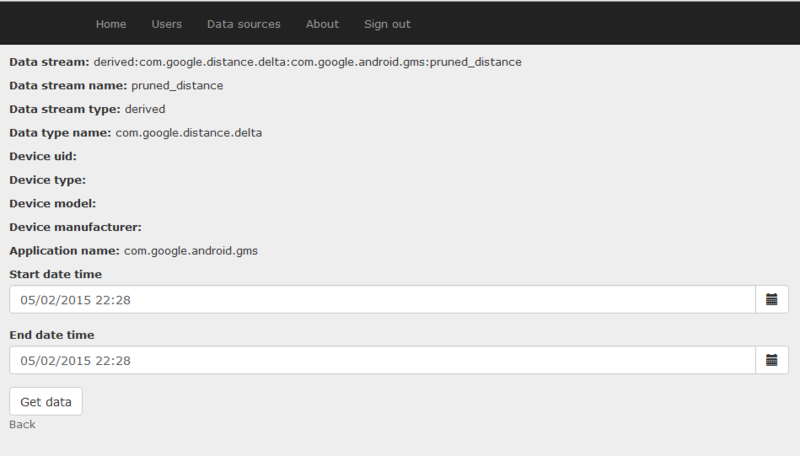 to get the package installed into your R.
The dataset contains the distance in meters traveled in the reading period. 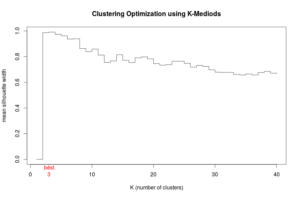 The data is filtered and preprocessed by Google in this datastream so I expect it to be clean without outliers. The dataset contains data about cell phone positions recorded. Analogically to the previous stream, it is also preprocessed. Despite having start and end time values are always sing time points. "0"  "1"  "3"  "7"  "8"  "24"
which respectively stands for: In vehicle, Biking, Still (not moving), Walking, Running, Dancing. It’s seems pretty obvious that the values are calculated basing on distance / speed. Still 2 of them were a bit mysterious to me. 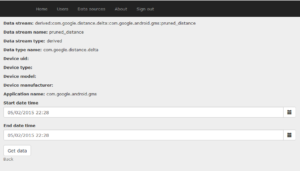 Dancing – Can Google really detect dancing from accelerometer data? No, that was my manual input in Google Fit app. A more interesting question is why Google decided to handle this as a datapoint value and not as a session. Importing is identical as before. As expected, the datastream gives step counts in the time period. Again, the function to import is provided. The last datastream is very similar to the steps except for that it provides cadence which measures the pace in steps per minute. All the above data are time series. The simple way to check if there is a simple link between them would be an attempt to just to merge them. Below are the observations counts for original end merged (inner jointer) time series. I tried merging both by start and end dates. "Distance + Location (startTime + endTime): 0"
 "Distance + Location (startTime): 2183"
 "Distance + Location (endTime): 2150"
 "Distance + Activity (startTime): 4"
 "Distance + Activity (endTime): 1"
 "Location + Activity (startTime): 5"
 "Location + Activity (endTime): 5"
 "Distance + Steps (startTime): 29"
 "Location + Steps (startTime): 45"
 "Activity + Steps (startTime): 33"
 "Activity + Steps (endTime): 38"
 "Steps + Cadence (startTime + endTime): 4698"
 "Steps + Cadence (startTime): 4812"
 "Steps + Cadence (endTime): 7595"
What are the times of the week I walk the most ? What are the top 5 places I spend my time at? I mean the 3 other than work and home. A quick check comparing sum of not binned and binned steps proved the function to work correctly. So here is a nice heat map generated using D3. Conclusions? My most intensive time is the daily commute to work, lunch times and some weekend activities. 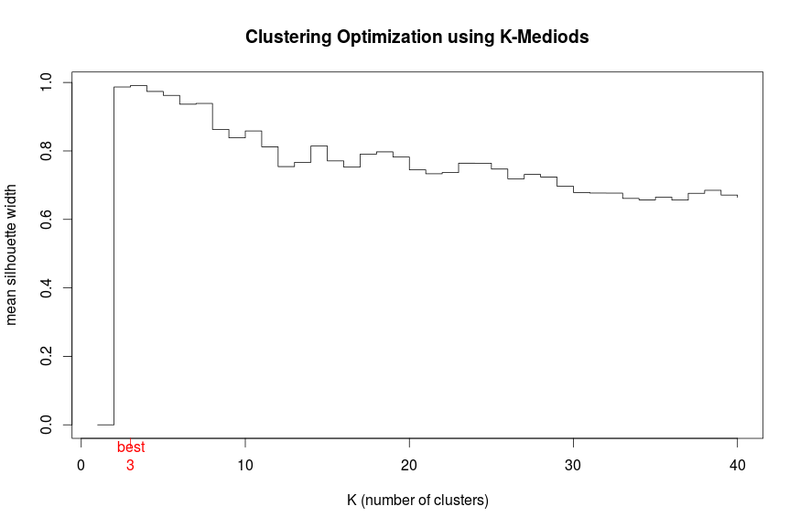 In this part of analysis I followed the ideas of Jeffrey Evans, with the remark that the literature widely accepts k-means based methods for spatial data clustering. The clara method proved quite efficient so I modified his function a bit. 2 – A hotel I stayed in during vacations. That’s a pretty surprising place, cause I stayed at other hotels longer. This might be related to Wifi readings. … and put it on a nice D3 histogram. Not too much running. I need to improve. Google Fit is a service that offers a broad set of data that could be a basis of many interesting research. It’s still a new service – span of the data is pretty short, documentation is not complete and there is no friendly way to get the data out.